WASHINGTON -- The United States on Monday called for the full enforcement of United Nations sanctions on North Korea as the two Koreas moved to establish rail and road links across their border. 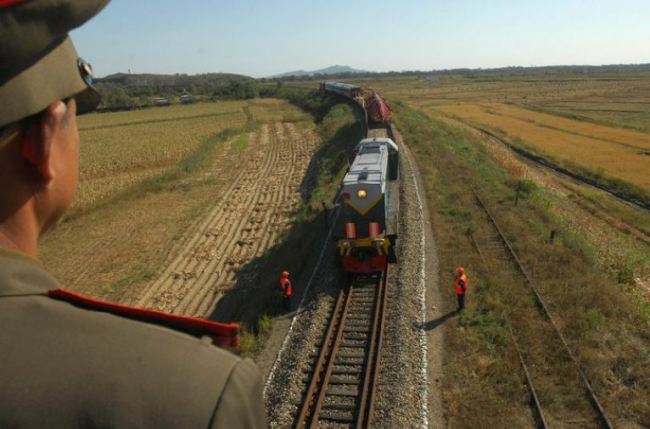 The two Koreas will hold a ground-breaking ceremony in late November or early December to start the modernization and connection of railways and roads along the eastern and western regions, the sides announced after high-level talks earlier in the day. The agreement is a follow-up to last month's third summit between South Korean President Moon Jae-in and North Korean leader Kim Jong-un. "As President Moon has stated: 'The improvement of relations between North and South Korea cannot advance separately from resolving North Korea's nuclear program,'" a spokesperson for the State Department said in response to a Yonhap query. Washington has said it will keep sanctions on North Korea until the regime abandons its nuclear weapons and ballistic missile programs. That position has contributed to the recent deadlock in denuclearization negotiations between the US and the North. "We expect all member states to fully implement UN sanctions, including sectoral goods banned under UN Security Council resolutions, and expect all nations to take their responsibilities seriously to help end the DPRK's illegal nuclear and missile programs," the spokesperson added, referring to the North by its official name, the Democratic People's Republic of Korea. The UN sanctions aim to starve the Pyongyang regime of funds and resources to develop its nuclear and missile programs through severe restrictions on trade. Moon's government has vowed to honor the international sanctions regime, but also raised the possibility of easing sanctions to incentivize the North to denuclearize. US President Donald Trump has said that he expects to meet Kim for a second summit after the US midterm elections on Nov. 6. US Special Representative for North Korea Stephen Biegun plans to visit Moscow, Paris and Brussels for working-level meetings with his counterparts, the spokesperson said, but there are no meetings to announce "at this time" between Biegun and the North Koreans.